Sebring’s Zach Doorlag scores during Monday night’s district game against Auburndale. The Blue Streaks beat the Bloodhounds by a score of 6-3. Sebring’s Joe Warner lays down the perfect bunt for a suicide squeeze that scored Drew Morris during Monday night’s win over Auburndale. 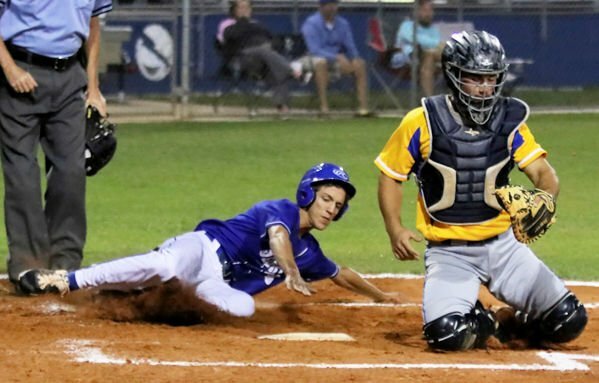 SEBRING – The Sebring Blue Streaks baseball team came out running and bunting to snap a three-game losing skid with a 6-3 win over Class 6A-District 10 opponent Auburndale on Monday night at Firemen’s Field in Sebring. This was the first of two games the two teams will play against each other this week. The win improved the Blue Streaks overall record to 8-9 and 3-1 in the district, tied with the Lake Wales Highlanders for first place as they split the two games they played this season. With this being the first of three games in three straight nights, Sebring starting pitcher Cody Carpenter came up huge for the Blue Streaks pitching into the seventh inning before coming out. Sebring set the tone early, loading the bases with no outs on a hit batter, a walk and Drew Morris beating out a bunt single on a 3-1 pitch down the third-base line. The Blue Streaks took a 1-0 lead on a bases - loaded walk to Carpenter for their only run in the bottom of the first. The Blue Streaks continued to show their aggressiveness on the bases in the bottom of the second after Zach Doorlag led off the inning with a double down the left-field line. With one out, Sam Lieske bunted down the third-base line in which the third baseman made the throw to first, conceding third base to Doorlag. Except Doorlag was not content with third base and never slowed down rounding the bag heading for home, catching the Bloodhounds off guard, Doorlag easily beat the throw home to put Sebring up 2-0. 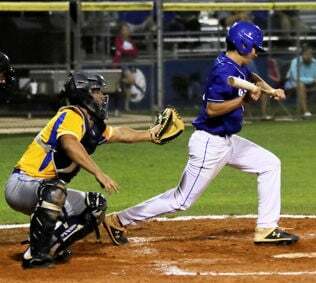 Getting the leadoff hitters on base became key for Sebring and the third inning was no different as Morris hit a leadoff single into left field past a diving Auburndale shortstop. Carson Angel followed with a walk and both moved into scoring position on a sacrifice bunt by Carpenter. Sebring followed with a suicide squeeze with a perfect bunt from Joe Warner to score Morris that gave Sebring a 3-0 lead. After Auburndale scored a run in the top half of the fourth, Sebring answered with three runs in the bottom half of the fourth on just one base hit and two walks. All three runs scored on wild pitches by Auburndale to put the Blue Streaks on top by a score of 6-1. The Bloodhounds scored twice in the top of the sixth to make what would be the final score 6-3 as Carpenter pitched through the sixth and one out in the seventh before hitting his pitch count. Charles Petty came on to close out the game with a pair of strikeouts with the Blue Streaks capturing a much needed 6-3 win. Carpenter pitched 6.1 innings, giving up three runs on four hits with four strikeouts for the win. Sebring hosted Haines City on Tuesday night. Complete story and photos will be in Thursday’s Highlands News-Sun sports section. The Blue Streaks are on the road tonight to play Auburndale.